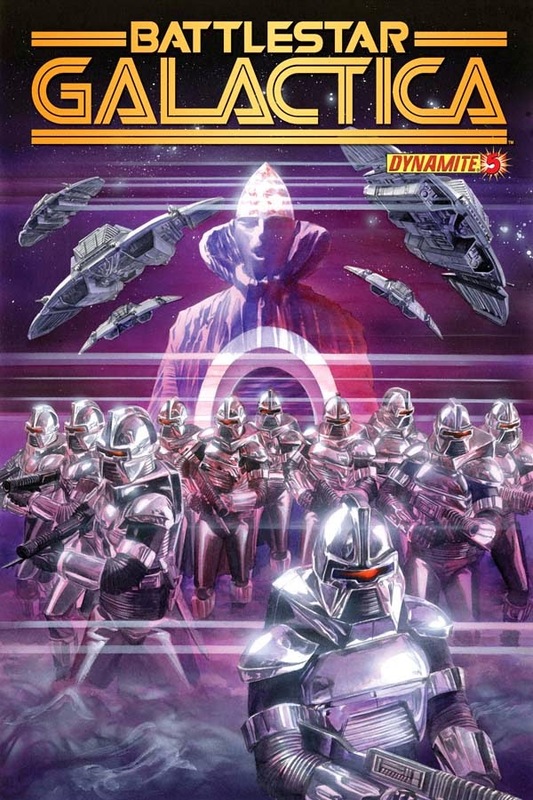 The Fellowship was fortunate enough to obtain a copy of BATTLESTAR GALACTICA #5 from Dynamite Entertainment. The story is by Dan Abnett and Andy Lanning, illustrated by Cezar Razek, colors by Vinicius Townsend, and lettering by Simon Bowland. Baltifer leads the Cylons in an all-out attack to eliminate the human resistance. Apollo reluctantly offers to lead them into his universe in exchange for stopping the attack on the planet below. Meanwhile, Starbuck is trying to convince this universe’s Starbuck to take the Galactica into battle. Will our heroes save the day and go home, or are the human races of BOTH universes doomed? I can’t tell you how much I love reading classic Battlestar Galactica again. Abnett and Lanning capture the action, adventure, and frankly the fun of the original show even with this being a darker story. It looks like Cezar Razek had some fun creating the alternate universe’s characters as well as the T-Drive Vipers. He does a real good job capturing the actors’ likeness. I really hope this is not the end of Abnett, Lanning and Razek’s tour onboard the Battlestar! BATTLESTAR GALACTICA #5 is in stores now, or available to order at www.Dynamite.com.